This IGP Chorizo is milder but uses sweet paprika to deliver a great taste. 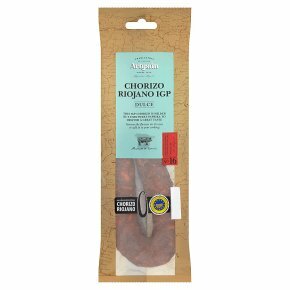 Savour the flavour on its own or add in to your cooking.Chorizo Riojano IGP is made in the La Rioja region of Northern Spain, following strict local guidelines to be awarded its IGP status. Made using a Duroc Cross breed of pig, it has a deep and mild flavour, which comes from the use of the sweet paprika. It only uses three ingredients and time to mature, with every pack having a unique number. Eaten within the region with a glass of wine, but also great when cooking. Warning: White salt crystals may form on the surface of the product. These are naturally occurring and are not detrimental to quality.